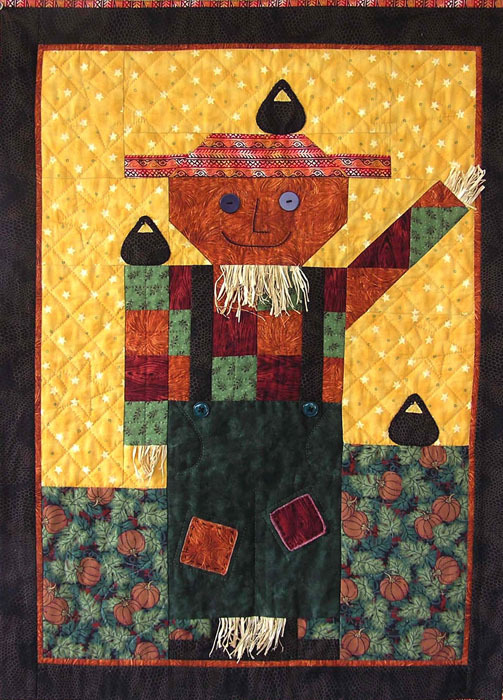 "Welcome to the Scarecrow Festival" a wallhanging I made for the 2006 Mahone Bay Quilter's Guild Challenge. Winner of the Annual Pumpkin Carving contest - the pumpkin walk brought out hundreds of people each night to see the creative pumpkins all lit up. The local constable enjoys his Timbits! 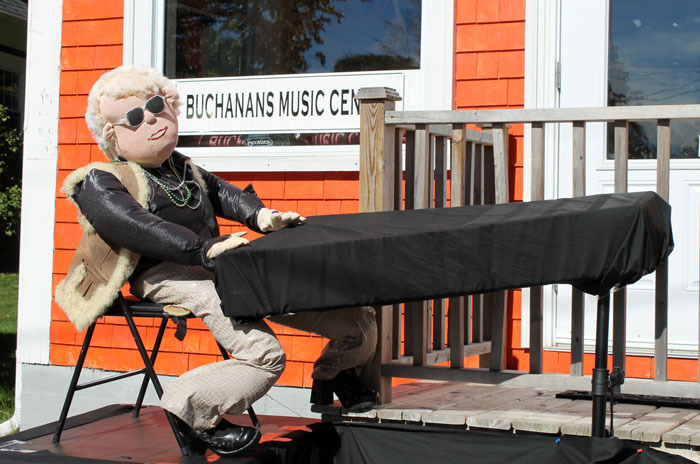 A fall tradition in Mahone Bay is the annual Scarecrow Festival. The town gets decked out with handmade scarecrows in front of many businesses, homes, the churches and along the waterfront. There were weddings, a visit with the Royal Family, hockey games and even a sighting of Elton John. A few members of the Royal Family join us. Lance Armstraw visits "A Sweet Ride", the local bike and candy store. The weather was superb, warm and sunny everyday. The crowds came out and the sidewalks were packed with people all day. We ran out of time to create a scarecrow for this year but we already have an idea for next year. On the roof at Joann's Market, a busy spot. A knitter relaxes in front of "Have a Yarn", our local yarn store. But next up is the Father Christmas Festival which comes to town early December, should be fun for kids of all ages! After 17 wonderful years in our Fox Point house by the ocean we have decided to make the move to the wonderful town of Mahone Bay. All being well we will be happily moved in by the end of the month. There is lots to do, packing, sorting, throwing out. Why do we let ourselves accumulate so much stuff? 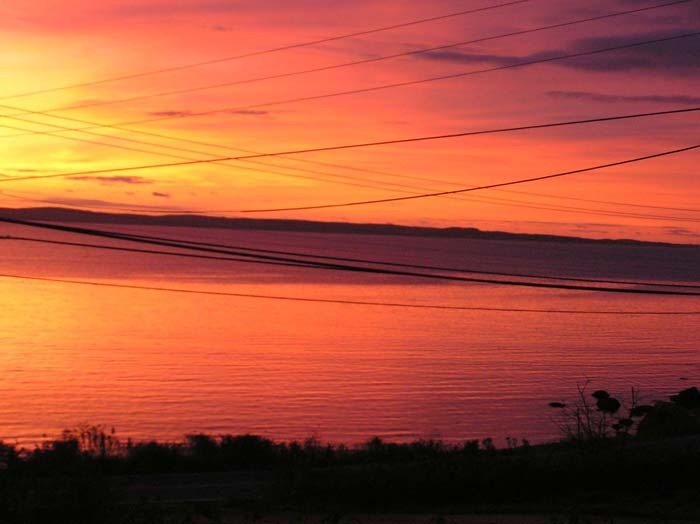 We will definitely miss this view, taken from our verandah, the sunrise we have enjoyed so often. If you look carefully mid right side you can see a lobster boat doing his circle, checking the traps. This is where we are moving to in Mahone Bay, a lovely traditional 145 year old South Shore house with a double "Lunenburg bump". The entrance to the secret garden room! We are going to be the caretakers of a wonderful garden! So much more to learn, so exciting to discover what is there. I can finally plant some tulips but I'll have to check and see if there are deer in the neighbourhood first. There is a secret garden room, statuary, cement urns - surprises everywhere. It is a much more manageable space that our 1.3 acres here! It will be fun to document what we do, the paint colours we chose, the fun we have, the challenges of a kitchen with 7 doors! Quilters are the best friends! Just by chance I mentioned to my friend Heather that I wasn't going to be able to make my annual donation quilt to our local daycare for a fundraiser. I had been putting it off and before I knew it I realized my cataracts had gotten the better of me and that they were "slowing me down"! Surgery will happen soon but I still felt bad that I hadn't gotten a quilt done for the daycare. They are a very special daycare, vital to our community as we found out six years ago when our twin grandsons were born. Mary Ellen and her tem just were wonderful in helping to care for our 2 year old grandson, when we all needed to be in the city at the hospital. They are a "not for profit" daycare, they offer subsidized spaces for those who need it and they work hard to give our local kids the best care possible. So for the last 5 years I have donated a quilt to help with their fundraising. Mary Ellen, some of the kids and "Backyard Fun" thanks to the Mellow Yellows! While in Calgary, I went to the Heritage Park Festival of Quilts. If you ever can plan a trip to Calgary try and plan it for around the end of May in time for this Festival. There over 800 quilts dipslayed inside, outside, in tents, over fences, hanging from balconies - everywhere you look there are quilts. A huge undertaking for a 2 day show! Quilts at the Wainnwright Hotel, they didn't stay up long as they showers persisted! I loved all the Halloe'en quilts. I loved this skeleton fabric - anyone know the brand/designer or where I might get some? This quilt was wonderful, see my Flickr page here for detail pictures of this one and many others! A favourite picture for Father's Day (a little late!) Andrew and Molly heading for golf lessons. My Dad and Peter's Dad (two of the best) would be so thrilled to see this!